I want a GT3. Let’s just get that straight right from the beginning. Sure, there are lots of other silly little life goals I’m working toward, like home ownership in Southern California (yeah, right), college for the kids, maybe retirement someplace quiet...but really, it’s all about that GT3. 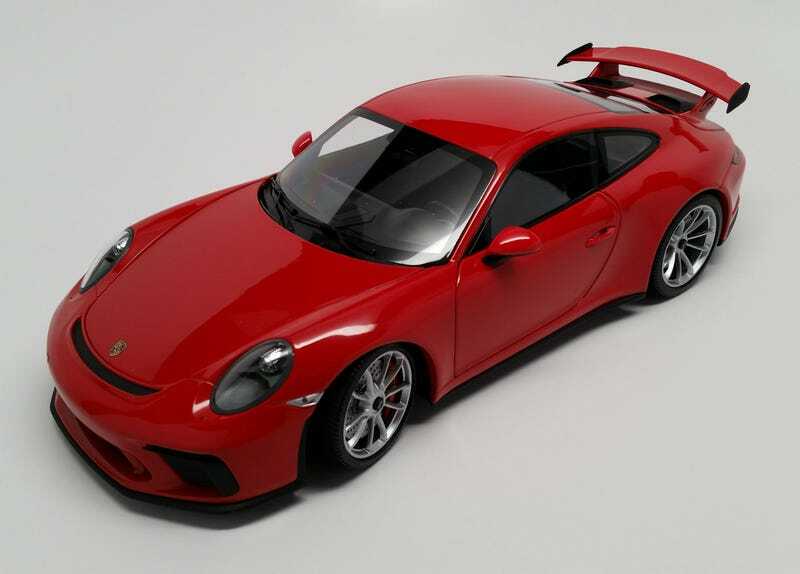 So, here’s Minichamps’ new fully-opening, 1:18-scale 991.2 GT3. This is one of two Minichamps North America-exclusive color combos (Guards Red with silver wheels) that were produced in limited runs of 299 units. I ordered three for the shop, but when the shipment arrived, that tell-tale rattle that all model collectors/dealers dread when opening shipments told me that something was not right with one of them. Sure enough, one was suffering from rear-wing detachment. It was easily fixed and indistinguishable from new, but...I can’t bring myself to offer a car that was once so messed up to a customer. And also, I love it. So, I’m keeping this one for myself. It’ll do until I can afford the real thing.